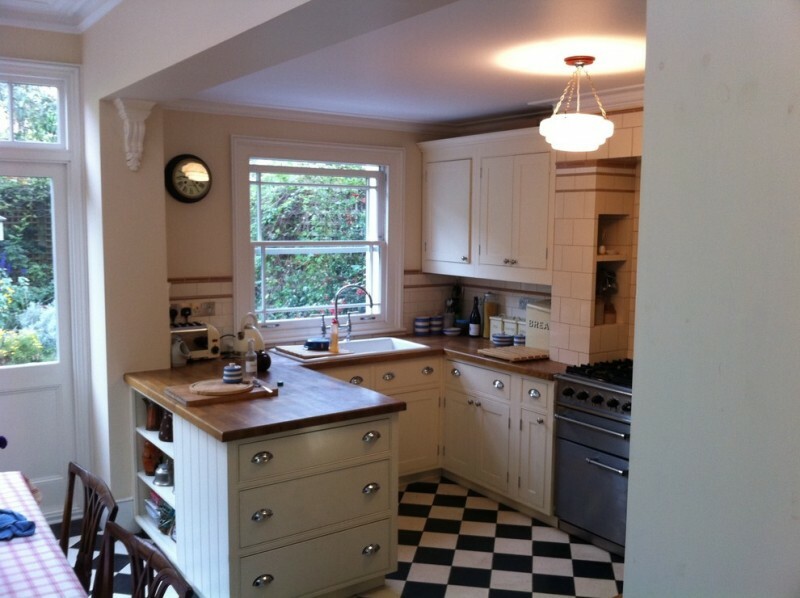 A peninsular kitchen refers to an extended counter area in a kitchen. A kitchen island is a great choice, but most of the kitchens don’t have enough space in the center of the kitchen space to put an island. A peninsula is popular because it is practical. The difference between peninsula and island is that a peninsula is butted up against the end of the kitchen cabinet or a wall. It is also a valuable addition to a kitchen because it can give you more storage and countertop space. You can put some barstools near it to provide a nice seating area. 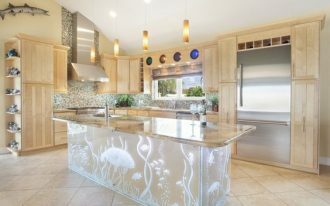 The following are some wondrous peninsular kitchen ideas that will inspire you. 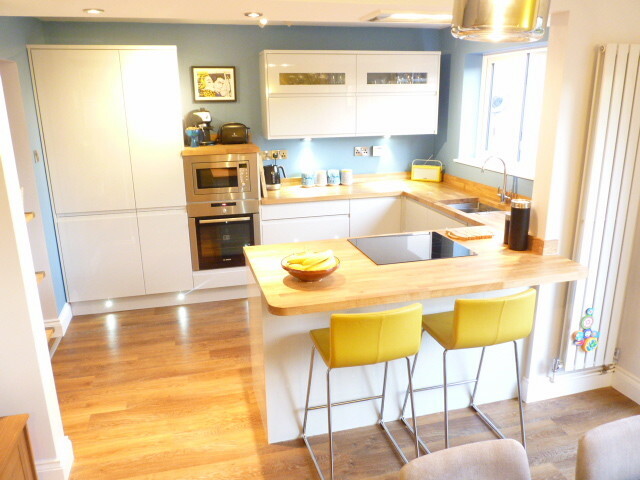 This kitchen has white dove gloss handleless kitchen cabinets, solid oak worktops, peninsular, and yellow barstools. 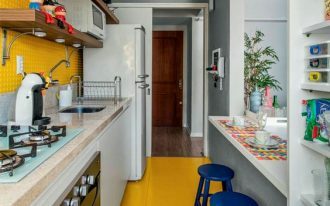 This kitchen looks clean and neat with this layout and colors. 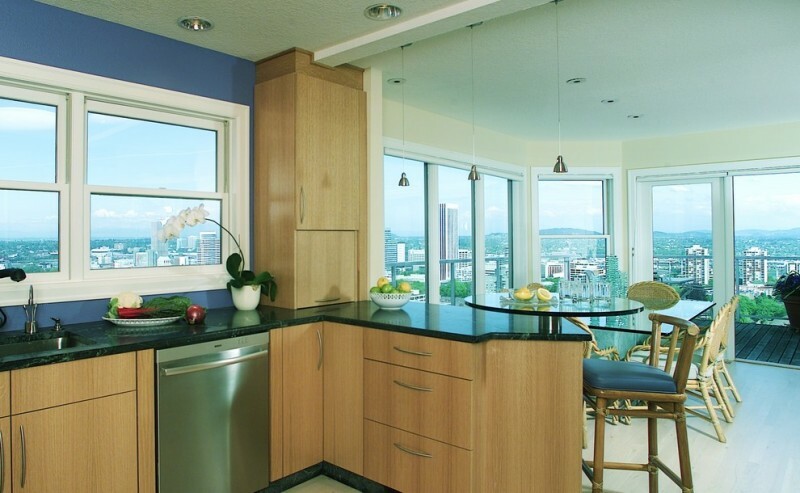 Furthermore, the windows above the undermount sink give natural lighting in this kitchen. Although this peninsular kitchen is on the smaller side, it still provides plenty foot area and countertop space. 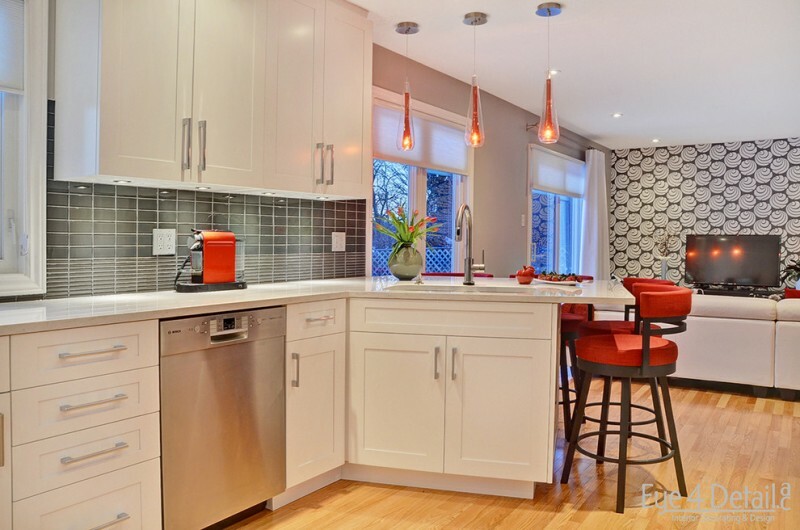 The red barstools and red pendant lights above the peninsula give nice color accents for the white kitchen cabinets. This home looks fabulous by providing glass windows all around. It gives natural lighting and a nice view of the outside. This kitchen features minimalist wood kitchen cabinet with black countertop, a corner lazy susan, and barstools. You can have fun black and white floor tiles when you choose classic kitchen cabinet with peninsula and an undermount sink under the window. The silver accents and open shelves in the kitchen cabinets make good details. 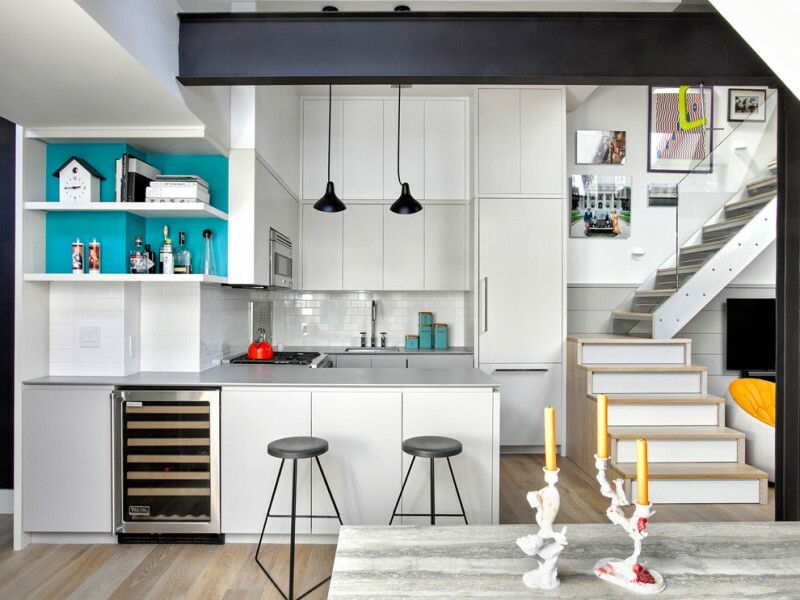 You will love this peninsular kitchen, it can maximize the kitchen use in this narrow space. 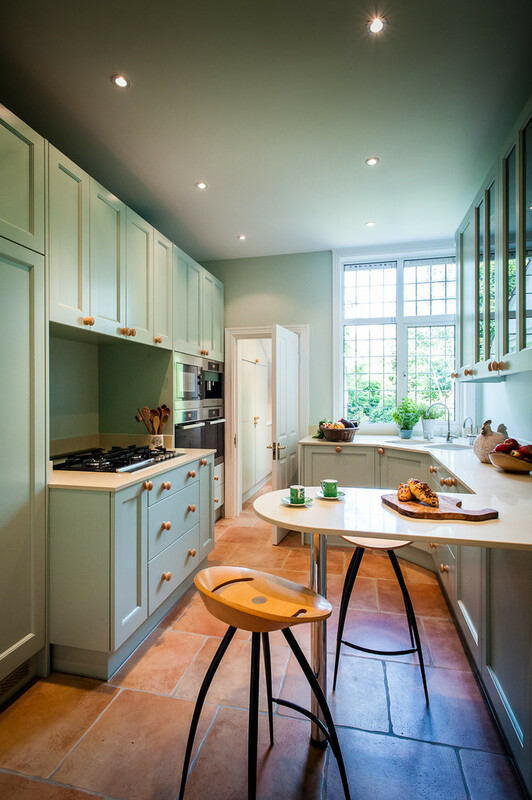 The terracotta floor tiles from Fired Earth are really stunning for this narrow kitchen with vintage green shaker cabinets. The chunky oversized brass hardware seems like jewelry of this U-shaped kitchen. 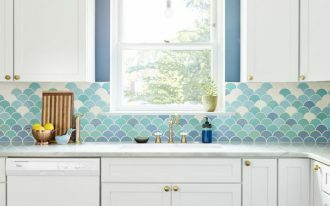 While the brass pendant lights in this kitchen add a midcentury vibe to the peninsular kitchen. 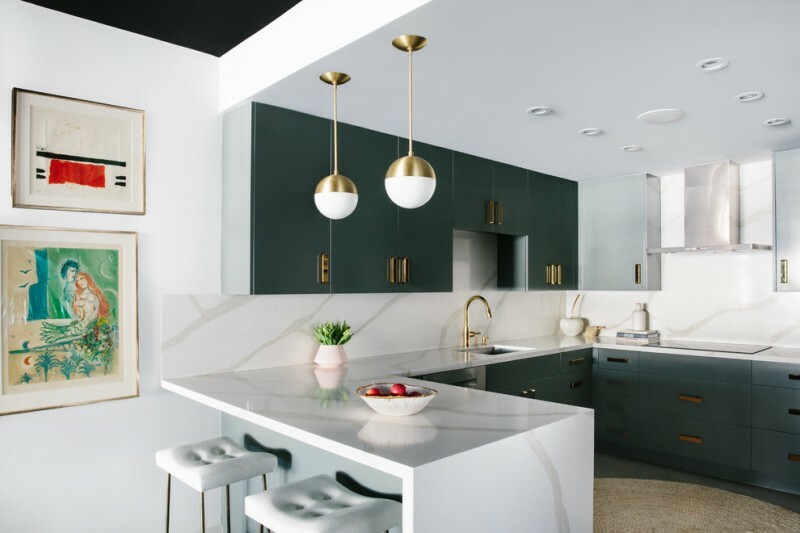 The countertop is Calacatta Gold from Silestone here is so beautiful. 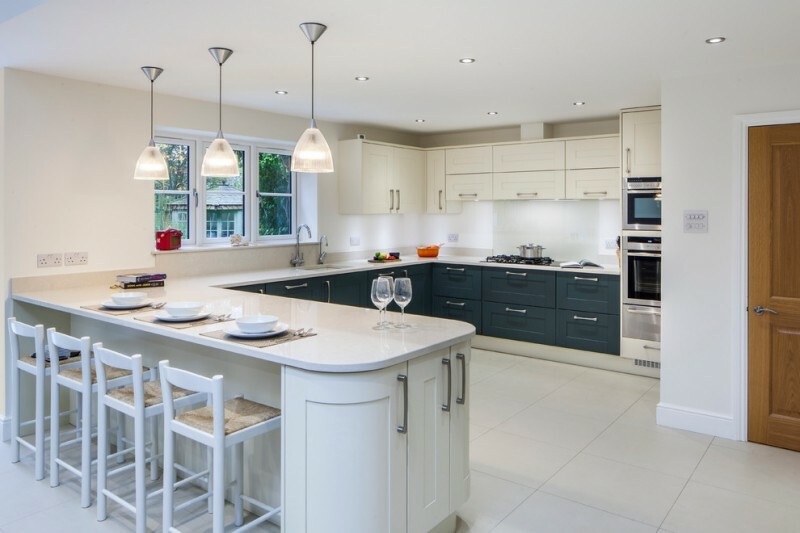 When you have a large kitchen space, you can also have a large peninsular kitchen with more barstools. 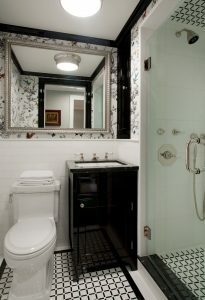 The white upper cabinet has recessed lighting underneath, while the bottom cabinet has nice dark color. You can put barstools on both sides of this peninsula and have a nice conversation with your partner. The glass front cabinets, recessed lighting, marble countertops, and the silver chandelier add glamorous vibe in this kitchen. 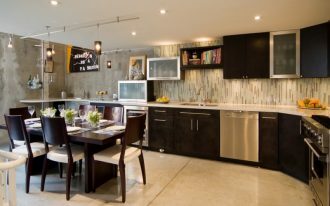 This kitchen features flat panel kitchen cabinets, an undermount sink, subway backsplash, and a peninsula. This kitchen layout near the stairs is amazing. 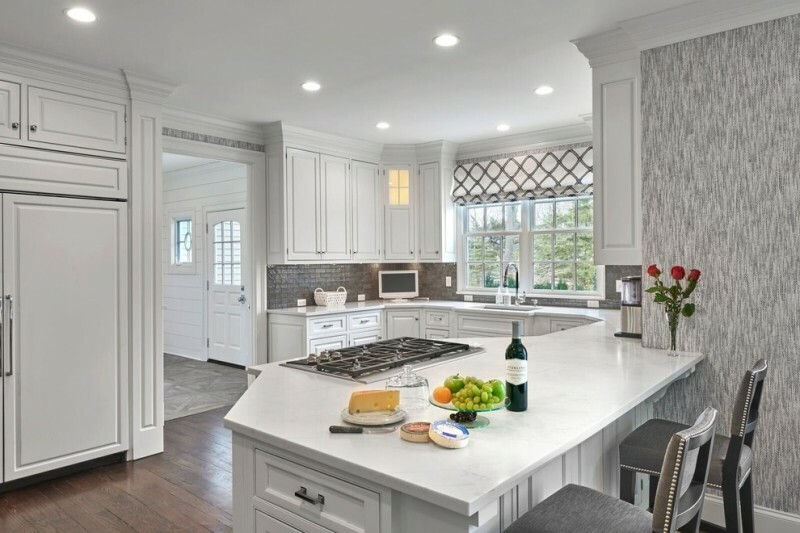 The white kitchen cabinets with peninsula give enough space to work and countertop. The barstools have a matching color with the wallpaper. There are also some drawers built into the side of stool seating.